We’re so excited to introduce you to our latest novel, and the last in our Esperanza Trilogy: Long Night Moon. When we first wrote Sunlight and Shadow, we had no idea it would be followed by A Growing Season. And then, after those two were out in the world, along came the idea for Long Night Moon, and we realized it would complete the arc that began with Sunlight and Shadow. It ended up taking three novels to tell the story of these two fine families determined to overcome adversity and thrive in rural New Mexico on the banks of the Rio Grande. Since A Growing Season’s debut in the fall of 2012, we’ve been busy! We launched A Growing Season at Bookworks in the fall of 2012—a wonderful celebration with family, old friends, and new friends. We joined the fantastic organization Women Writing the West and attended our first WWW conference in Albuquerque. We were welcomed by Treasure House Books in Old Town in November and the Taylor Ranch Library in December. 2013 dawned with the blessing of acquiring our beloved agent Liz Trupin-Pulli of Jet Literary Associates to pursue finding a home for our other novels in New York. We continued to be active with literary luncheons, book festivals, and the great fun of meeting with book clubs in the area. In February, Sue traveled to South Padre, Island, Texas, to present a talk and sign books at Paragraphs, named by Lone Star Literary Life Readers’ Favorite Texas Bookstore in 2016. Great job, owners Joni Montover and Griff Mangan! Then, A Growing Season was named a finalist for the prestigious NM Press Women’s Zia Literary Award. We received the award at a lovely luncheon in April—what a fine organization! 2013 culminated in receiving the Tony Hillerman Award for Best Fiction—truly a shocker!—at the New Mexico/Arizona Book Awards. A Growing Season was off to a great start! 2014 kicked off with the Bad Girl’s Book club—shenanigans and book talk over a wonderful dinner prepared by the bad girls themselves! Thanks for a great time, ladies! 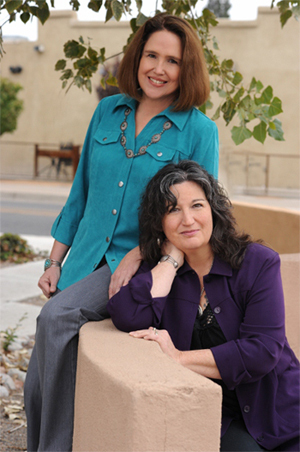 In April we presented “How Our Collaboration Strategies Can Benefit You in Your Fiction Writing” at the annual UNM Continuing Ed Writer’s Conference. In October we traveled to beautiful Golden, Colorado, to present a workshop at the Women Writing the West Conference, and to revel in the company of our sister writers. In November, we presented “Strategies for Successful Collaboration in Fiction and Nonfiction Writing at the Tenth Annual Hillerman Writers Conference in Santa Fe. A huge thanks to Wordharvest’s Anne Hillerman and Jean Shaumberg for the opportunity! The year ended with another shocker: Sunlight and Shadow won the Tony Hillerman Award for Best Fiction at the New Mexico/Arizona Book awards! Both of our novels won the same award in back to back years! In 2015, the muse called and we returned to our writing caves to write Long Night Moon. The idea for it came once again in a vision Sue had, seeing a little boy in danger. We soon learned the boy, still a toddler, was Santiago’s son, conceived without his knowledge at the end of A Growing Season, just before he leaves for college. Knowing we had to find out more, we began to write. After several drafts, we submitted it to Elise McHugh at UNM Press and it was accepted at the beginning of 2016. After a year of revisions with Elise, copyediting with Diana Rico, page-proofs, etc., our new book is born. Long Night Moon launches March 11, 2017 at Bookworks at 3pm. Please join us! We look forward to meeting you at your book clubs, libraries, bookstores, conferences, or at the local brew pub! Just let us know! We are filled with gratitude for our lifelong friendship and our creative collaboration that has so enriched our lives and sparked into existence the characters and the world of Esperanza, New Mexico. It is a world we have come to love, populated with characters so real to us by now, we will miss them as long lost friends. We imagine their lives continuing, wrapped in one another’s arms, ready to face whatever life throws their way. After all we’ve put them through, we wish them peace. We can hardly believe it has been eight years since Sunlight and Shadow was first published. We had such a wonderful time getting to meet readers at bookstores, book clubs and events all over the southwest and Iowa. Somehow we balanced all of that with fulltime jobs and family life. We heard from readers all over the world via email. We appreciated all the generous praise and heartfelt feedback. The echoing refrain was that Sunlight and Shadow's ending left them wanting to know more about what happens to the characters after the last page. At the same time, New Mexico began to experience a terrible drought that affected the family farmers up and down the Rio Grande valley. We began to wonder, too, how this would impact our fictitious chile farm, Sol y Sombra. We also wondered about little Santiago and all that he had been through in Sunlight and Shadow and how that might continue to affect him as he became a young man and was ready to embark on his own life. Mare and I began to write to find out. We picked up the story seven years after the epilogue of Sunlight and Shadow so that Santiago would be graduating from high school.Then one morning I was walking the UNM North Golf Coursewhen I came upon a fallen cottonwood tree next to the path. I was amazed that such a tree could simply topple over. There had been no high winds or storms the night before. I had the sudden image of Santiago confronting a fallen cottonwood and the sense of dread and unease it triggers for him, seeing something that was so huge and stately and strong was now lying helplessly against the earth, dying. As we explored Santiago's haunted psyche, a mystery even to his own conscious mind, we wondered about the other characters. Abby, dealing with adopted son Santiago's mood swings and changing behavior, begins to wonder if she can open her heart to love again. Just to make things more difficult for her, we decided to pair her with the endangered silvery minnow research biologist who inflames the farmers with his support for the tiny fish that has become the symbol of the battle for water necessary to irrigate their crops and save their way of life. CeCe finally must deal with her Jewish parents and their decades-long-disapproval of her marriage to Miguel. So we gave her the inescapable situation of having to take in her parents after they lost their money due to her father's dementia. Her parents, Rose and Mort, add to the stress of the drought-ravaged farm and strain CeCe and Miguel's relationship. Their presence alsosurfaces CeCe's pain of growing up with an angry and damaged father. Rachel, who has reunited with Charlie, grieves that she can't have more children due to an emergency hysterectomy after the birth of her six-year-old daughter Hattie. In Sunlight and Shadow, Rachel is defiantly self-identified as Hispanic and shuns the Jewish half of her ethnicity. Now, helping to care for her Jewish grandparents and learning more about the holocaust due to Mort's renewed trauma of narrowly surviving the notorious death camp, Treblinka, she begins to explore her Jewish roots. So, you readers were right. The good people of Esperanza, New Mexico, still had stories to tell. It was a great experience for us to delve into the water issues that confront us, learn more about the holocaust that should never be forgotten, and most of all, spend time with Abby, Santiago, CeCe, Miguel, Charlie and the new folks who come into their lives. We hope you have as much enjoyment reading A Growing Season as we had writing it. We're mostly retired, now, from the fulltime grind, and that allows more time for writing and meeting readers. So, best wishes and we hope to see you at your neighborhood bookstore or your reading groupor at a local farmers' market. Tell us what you think. We know you will! © Sue Boggio and Mare Pearl All Rights Reserved Worldwide.